Well......my little blog will be 2 years old on Sunday and I've decided to mark the occasion by giving away the "bestest" art book ever. I absolutely love, love, love this book!!!! It's unusual in that it is so full of information and projects for teachers/parents. Not a ton of photos so it can turn people off at first glance but if you give it a good look you'll realize the wealth of info here. I used to take the old edition out of the library continuously but then invested in my own revised copy when the late fees could have easily paid for the book 5 times over!! I lost count at 60 but I'm sure it must have close to 100 projects detailed in it's 288 pages. So if you are interested please leave a comment before midnight Sunday July 11th and I'll make the draw on Monday. Good luck everyone and thanks so much for supporting me in my little blog adventure! i really enjoy your blog, actually i wrote about it just today. congrats on two years! this book looks really interesting. your blog rocks - it's part of my daily rss feed check. and wow, i'd love this book! i am an art therapist. i worked in a multicultural center for a year, and i am about to return to work working with a diverse group of people this fall. it'd be put to great use, for sure, in my practice and also in making art with my daughter. Looks like a great book! I know I could get alot of use out of it! I love your blog, great ideas all the time! Looks like a great book and I love your blog! We have done a few of your projects and they always turn out well and we have a lot of fun. I would love to win that book! I do projects at home with my twin 3 year olds and am always looking for new ideas. I love the resists that you posted in your last 2 posts. So cool! I'd absolutely love to win this book. I run a very multi-cultural home daycare and am always looking for projects that are diverse as well as beautiful. Hello Gail - happy 2nd blogbirthday! I found your blog last year and have loved your wonderful art ideas - they are so varied and so inspiring because of that. Ours is a very multicultural family so I really enjoy learning about art forms and crafts from all over the world. I would love to win this book - thank you for this generous and fun giveaway! I really enjoy your Blog and I send links from your postings to lots of friends. I'm a puppeteer and I'm always looking for projects that can become puppet workshops. Schools & libraries have less funding for performance and at least some for elementary school age workshops. Keep those ideas coming (and pick my entry for the book!). Love the pastel resist projects you have posted this week. The giraffes and zebras work perfectly with the medium. 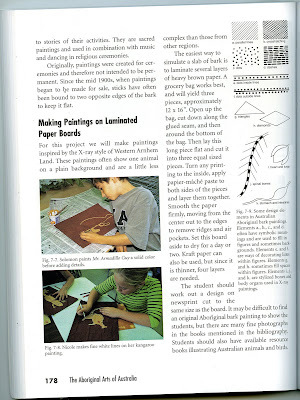 And I am always up for new ideas for my elementary art classes- that book looks like a great resource! Thanks for being a great resource yourself for the last two years! I love your blog! I also love the fact that you are Canadian. I use your ideas all the time. Its my first stop when I am looking for a project to do. Thank you so much for sharing. Congrats on your 2 years! That's a good milestone. This book looks great! As an art teacher of grades 3-6, I can always use more ideas. Thanks for the offering. I don't comment as often as I should, but I LOVE your blog. You have such neat methods. I've done a lot of your glue batiks. Happy Birthday to your blog! Thanks for all the great ideas. Grats! That does look like an amazing book. Happy 2 years blogging to you! I would love to win a copy of this book for my sister. She's currently studying to get certified as an art teacher for children and would adore this book. Either way, it's on the wish list for sure. If this book is your inspiration-I'm interested! Congrats on two years and thanks for the giveaway! Congrats on 2 years! Your blog is very inspiring. Just the kick in the pants I need to pursue my art endeavors. Here's to 2 more years and many more of those after! Two years ... and I just discovered you within the last 6 months! You always have such wonderful projects ... thanks for sharing with the blogosphere! Try this one again...I hope my head isn't cut off again...I totally agree amazing book filled with all sorts wonderful projects. I teach an enhancement 7th grade World Art Class and adore picking out and adapting these projects. This looks like a wonderful book. I do a lot of around the world art theme classes and mini camps. Thanks for all your great posts. I have done quite a few of your projects: owl portraits, salt dough creations and painted silk scarves. All with great results. I have many more on my "to do" list! What a great giveaway - lookslike a fabulous book! I enjoy your blog. Two years is a long time - impressive! I'd love to win this book - never seen it before and it looks like it is full of fun ideas. This looks like such an interesting book! Happy Anniversary! Keep up the good work. You've inspired many projects. Thanks for your blog! I really enjoy your projects, and the step by step instructions that you post. Gail, I love your blog. I spent hours going back through past projects and articles. You have some really awesome ideas, and a few great twists on classic projects! I lost my art teaching gig for next school year. So I will miss my students, but another opportunity will find it's way. I own a Paint Your Own Pottery studio, so I am always looking for new ways to paint stuff. Thanks for your efforts, and congratulations on two years! I've got you on my feed and always love your ideas. Very neat book. I just picked up something similar from the library geared towards children - I don't have the title handy. I have been enjoying your blog for awhile now. I used to teach Math/Science and 1 period of Art to 6th graders at an J.H. I'm now a SAHM, but I'm always "collecting" ideas for teaching in the future and for stuff to create with my own children. This Art book looks wonderful. Im' in for the competition. The book seems very useful. Every year we do a Multi-Cultural Day show at my school. This would be perfect to have around. I love your blog! Thank you so much for all your hard work and for sharing your incredible ideas. Congrats! I have just discovered your blog and others associated with it and I am absolutely intrigued in it all, and am very excited to keep delving into the world which your blog and others are opening up for me to help inspire me to share wonderful things with my daughter. lol, happy 2 years, congrats :) and wish much more :) i love Your ideas, help me with my work with children :) ..i try luck ..
Congrats on your lovely blog. Wow only 2 years and so well established! Great work! Thank you for your fabulous blog and creations! Love your blog. Very inspiring! Thanks for the book recommendation.Sounds great. I plan to offer a *Cultures through Art* workshop for children this fall and winter and will definitely check it out. Congratulations!Your blog is gr8 and I've subscribed to it too! My passion is gardening but of late I'm discovering my love for making new crafts esp for my five year old and you are a big inspiration!! Would love to have that book!! my girls and I love your blog and do your projects all the time! Happy Anniversary..........I love your site and have recommended it to my niece. She teaches Art in the local elementary school. Your site has even encouraged me to get creative. Thanks! Congratulations! Your posts are a constant source of inspiration. The book looks great. Congratulations on 2 years! I enjoy the creativity and the caliber of your art projects - they inspire me in my Elementary Art classroom! The book would be a great resource for the next school year. Oh, I'm crossing my fingers!! Congratulations on your successfully inspiring blog. May you keep going strong for many, many more years! Thank you so much for sharing your experience and knowdledge! I'm homeschooling my two girls, and my oldest is Autistic. Art time is such an important part of our day- I can always use some more inspiration! My children and I would love to own this book! I am so non creative that you have helped me see a whole new world. Congratulations on two years! I just found your blog this summer but I am pretty sure I have read every post at least once. :) Your ideas are great & I'd love the chance to win this book. Congratulations on your two year anniversary! I thoroughly enjoy your blog and have recommended it to many friends....I'd love to win this book, it looks wonderful! I really enjoy your blog. You have some fantastic ideas! Thanks so much for the chance to win your book. It looks amazing! Congrats for two years. I love teaching art and using new lessons. Thanks so much for your fantastic lessons. ALWAYS looking for new ideas with your blog, and this giveaway book looks wonderful. Happy Blog Birthday and here's to more of the great ideas to come from you Gail. I have enjoyed your blog for a year now and it has helped me through my first year of art teaching. Keep those projects coming, and keep the creative spirit too. Happy 2nd Blogiversary! I have really enjoyed your posts. It is great to see what project you are working on next. I always look forward to them. Thanks for posting. And thanks for having a great giveaway! I am new to your blog, and you have some great ideas and projects, which my children have greatly enjoyed. I was looking at another art book, but this one that you suggested does look interesting. My daughter, who just turned 6, has told me that she wants to be an artist, since the day that she could express that thought. Hi Gail. I've been following your blog ever since I found a link to your glue batik tutorial (which I've done with great success). It turns out my son's kindergarten teacher (I was raving to her about your blog) met you at a workshop (last year?) here in Calgary. Thanks so much for sharing your wonderful, creative, and inspiring projects! I posted a link to your giveaway @ forloveofmyoceans.blogspot.com hope you don't mind! This sounds like a great book for my home schoolers!! You've already helped me so much with wonderful art projects for my children. Thank you so much for this blog and thanks for the opportunity to win this art book. Happy Anniversary! My three babes would love for me to bring a copy of this book home. Even if we don't win, it's on the library list. We do hope you keep on blogging as we are really having fun and learning lots with your projects. Your blog is one of the first I look at each day. There is always something new and fun to think about. Congrats on 2 years! Please enter me, the book looks awesome. I just love your emails. Have gotten a lot of great ideas for working with the kids at camps and other programs. I would love to win a copy of the book. Thanks for your inspiration! Thanks for the fun giveaway, and the chance to win! We have glue batiks drying as I write this! Cool! My mom and I are big fans of your blog and we hope that we win! LOVE all the resists you do. But my glue is always to runny. Happy 2nd Anniversary and thanks for the giveaway! You have a wonderful blog. Happy Anniversary! I have definatley used a few of your posts as inspiration in my classroom (K-5)- THANKS! I am surprised I am not aware of this book! I love Davis Publications. I have just started following your blog, and love it. I'm a Grade 3 teacher, and am so excited about incorporating many of your projects into my art program this upcoming school year. The book sounds fantastic! The book sounds great!Thanks for the giveaway!I love all the craft ideas for kids.Congrats on your 2nd anniversary! The book looks fantastic your blog is really really helpful keeps the creative thoughts flowing...thanks you for sharing. It all makes my job more fun. this book looks amazing!! It would be perfect to use with the kiddos in my art therapy groups! What a wonderful way to celebrate two years! Please include me in your draw, the book looks great!! Congratulations on 2 years! I'm not even sure how I got to following your blog, I think I got your link from a friend when we were talking about Christmas projects? Anyway, I've been a loyal follower ever since. I love that you are sharing something that is off the beaten path, but so real. Thank you for being you and sharing so many wonderful art inspired blogs. I thoroughly enjoy your posts. I would love your give away, but no matter what...I am a fan! That looks like such a great book! I love your blog and would love to enter this contest. Wow! two years! way to go! Love you blog. My family home schools and we will be studing MFW countries and cultures this coming year. This book would be a blessing. This would be a fabulous classroom resource! I would love to get my hands on this book. I started reading/using your blog as a way to let my grand daughters develop their imaginations, abilities, confidence in their creative processees, but now I use it for myself a lot too. While your projects aren't aimed at the 70 + crowd, I can attest that they are fun and challenging. Congratulations and thank you so much. Looks like a great resource! Please enter me in the give-away! And congrats on 2 years. I love your blog! Thanks for sharing your wealth of knowledge, congrats on two years bloggin'! Love your blog, glad I found it. If you like the book, I am sure I would too!! Glad I found your blog. You are amazing and I enjoy all of your ideas! happy birthday little blog!!! we've been following you for the last year or so, love your stuff!!! I was thrilled to find your blog a couple of weeks ago. I sat in amazement commenting to my husband about how much I loved your art projects. Our styles are similar. I teach art at an elementary school where at least 95% of our kids are minorities. I also have an adopted little girl from China, so I am always looking for multicultural projects. I would love to win this book. Please continue making interesting art projects for kids. Wonderful book. Enter me, please. My sister and I love your art projects. I would like to give this book to her when she graduates with her Elementary Art major this winter. Thank you for your blog! love your blog! i check it daily to get ideas for my art camp this summer! Congratulations! That looks like such a great book. Thanks for all of your great projects and ideas to keep my girls busy, we are a bit art crazy in this house! I teach EFL in Portugal. I don't know if you would send here but I love using art to teach English! Love your blog!! Have used it for inspiration on quite a few projects this year. The book would be a great addition to my curriculum. 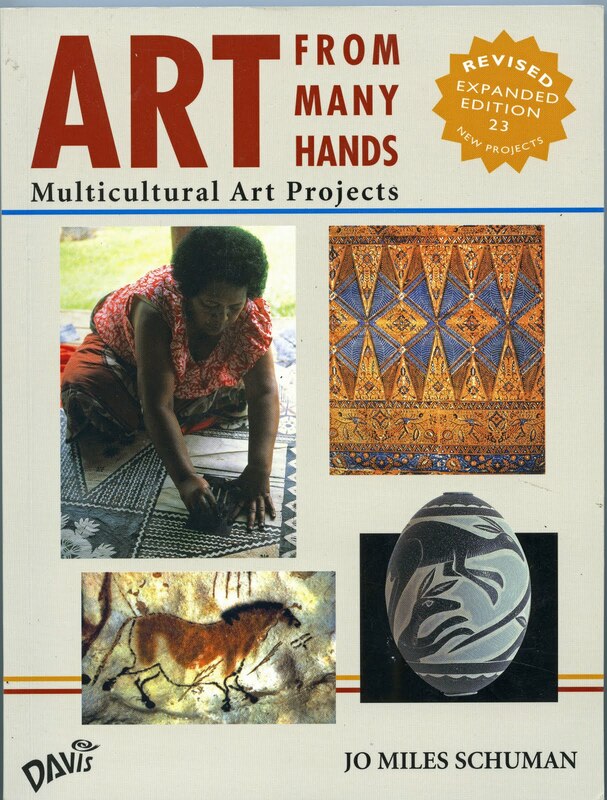 Looks like a great book for multi-cultural inspiration, and which art teacher isn't looking for this constantly! Hi Gail! Congratulations on your 2 year anniversary! I love to read your blog. Many of your ideas have been used for my Sunday School class or Girl Scouts, even my daughter's birthday parties. I'm looking forward to trying the glue batik technique. Thank you for sharing! Congrats and thank you for your great ideas and this kind giveaway. I love your blog; my kids and I regularly enjoy your projects. Your blog is 2/3's of our homeschool's art curriculum. Thank you! Congrats on the 2 year mark! Your blog is inspiring, I just love your projects. 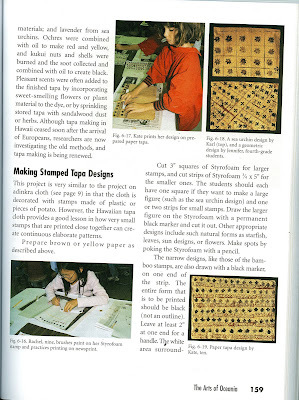 Would love to win this book - I just love project books! Congratulations and thank you for sharing all your artful ideas. I've tried a few of your projects in our preschool and we love them. Your book would be a great addition to our school resource. I would love to win this giveaway. thank you again. Congratulations on 2 years! What a wonderful blog and you're wonderful to share all of your ideas. I'm a K-5 art teacher and am always looking for new ideas and your blog is an inspiration. The book looks like a goldmine. Thank you for such an inspirational give-away! Your blog continues to stretch my mind and open me up to new thoughts...thank you! Your blog is amazing! This book seems super interesting, great give-away! Thanks so much for your wonderful ideas. As a retired teacher who continues to work with kids, this particular book would offer inspiration and how-to. I don't have a URL,etc. but check in often! As a teacher I could really use this book! Thanks for the giveaway! I am a 4th grade teacher who is trying hard to fulfill her obligation to teach the standards, but also to make learning enjoyable and interesting for my students. I am working hard to incorporate more art into my weekly lesson plans. Would love the book if I win. Thanks! Congratulations on 2 years! Your blog is wonderful and I love your creativity and great ideas. Thank you so much! OOoooh! It is 12:04 and I have technically missed the deline my 4 minutes. i just read your blog for the week and saw this book. Love it and would love to be the recipient of the wealth of info. I ama home school mom and do a little art class for all the neighbor kids who also home school. Please consider my entry!! Thanks so much! Your blog is outstanding! I use it often as a trusted resource. Wow - how to get some interest in your blog!! Even as far away as Western Australia- Thanks for inspiring me when after 21 years I started to run out of it!! Thanks so much for this blog, Gail. I really appreciate your effort in sharing your ideas, techniques and insights. Although I am an Art teacher in New Zealand at High school level, I have at least a look at your blog once a week. You always inspire me and even if these projects are mostly for younger children, I can still use many of your ideas and just level it up a bit:) Thanks again! This site Rocks! My all of my art classes thank you. I am always inspired.